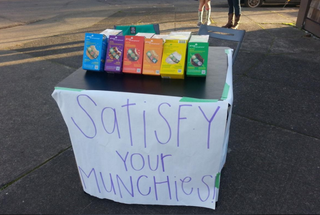 The sign the Girl Scout had up on her little booth in front of Foster Buds in Portland, Ore.
One particularly business-savvy Oregon Girl Scout is making headlines after selling her cookies outside a marijuana dispensary, smartly targeting those picking up their fix who wanted to do some smart planning for when the munchies hit, KATU reports. The girl set up shop, under the supervision of an aunt, outside Foster Buds Marijuana Dispensary in Portland on Saturday, hoping to raise money to visit a summer horse camp. The aunt told the news station that they, not surprisingly, had a number of customers within minutes of putting up a "Satisfy Your Munchies" sign on the little booth. "The Girl Scouts organization said they don't condone this, but it's not against the rules," the aunt explained. The cookie team even got a little partnership going with the dispensary. On its Facebook page, Foster Buds promised those who showed their box of Girl Scourt Cookies a specially priced eighth of "Farmer 12s Girl Scout Cookies" weed, the Huffington Post reports. The girl had a lofty goal set of selling at least 35 boxes of cookies—which, Wave3 News confirmed, she had done by the time she left the site that day.